Below I’ve translated a selection of Gelfand’s responses, including his opinions on various openings (the Petroff, Najdorf, Anti-Moscow Gambit and Pirc), Ivanchuk, young players like Nakamura and Carlsen, FIDE officials, Danailov’s cube… and the football World Cup (the interview was given over a month ago). The headings are taken from the original. I’ve left out the names of those asking the questions (and saying hello Boris, and so on) as otherwise it would get a bit messy. Is it true that in games between top players 80-90% of the result depends on the opening – preparing for an opponent, catching him out with a novelty/variation and so on? No, it’s not. At the very highest level losing or winning games in the opening is only likely if you play a very risky or rare line. But if you play normal openings even if your opponent catches you out then with white they’re unlikely to get more than +=, or more than equality with black, so that afterwards it still comes down to the ability to play chess. The higher the level, the more likely that is. Take Carlsen, who’s now one of the best players in the world: he doesn’t stake a lot on the opening but tries to get playable positions – with great success, as we’ve all seen. How much influence do you think “opening fashion” has on the opening repertoire of the top hundred players (e.g. the universal devotion of elite, and not only elite, GMs to the Anti-Moscow Gambit)? Fashion does have a great influence. Even Botvinnik (or was it Korchnoi?) said that there are chess players who move theory forward, and there are others who consume it. There are players-researchers, who love to analyse and work a lot on the openings. And others who look at a game by Kramnik or Anand – and immediately add it to their repertoire. Well, after checking it, of course, on the computer to see that there aren’t any particular holes. Probably about 10-15 people set the fashion and those, as a rule, are the very top chess players. While the majority follow. Actually the Anti-Moscow isn’t in fashion any more. In the past half-year after the Tal Memorial, where Leko lost two games, it’s barely been used. But now in Dagomys I managed to beat Grischuk, so maybe it’ll come back into fashion. We’ll see. Do you find that in a particular tournament situation against a particular opponent you would choose (if, hypothetically, you had the choice) the black pieces instead of the white, or is the right to start always an advantage? Overall the right to make the first move is always an advantage. With some opponents it has more significance, while with others – less. The drawing of lots at a tournament is always quite important. Sometimes you get white with a player who aims for a complex game with white while not trying to set particular opening problems. And you get black against a white specialist. If you take the very top, then it’s better to have black against Carlsen and white against Kramnik than vice versa. Because Kramnik is a clear case of a white specialist, while Carlsen, as mentioned, doesn’t go for a real advantage in the opening and simply tries to get a complex but playable position. You can find a lot of similar examples. But if it’s just in one game then I’d always prefer to have white. In your opinion which first move is stronger: (1. e4) or (1. d4)? Have you changed your opinion in the last 10-20 years? That’s a good question. I can tell you a funny story. About 8 years ago Sasha Grischuk said two things to me: “Do you really not see that e4 is stronger than d4?! Why on earth do you play d4?” and, “the Najdorf loses. It’s an incorrect opening”. And now he mainly plays d4 and the Najdorf. For a while myself, perhaps under his influence, I returned to e4, which I’d played for the whole of my childhood. Of course, both the one move and the other are entirely playable. It’s a question of style. One person likes the positions arising after e4, while someone else likes those after d4. Of course, ideally, a chess player can play both moves. It widens his range of weapons. Do you think that after e4 the move d6 is a reasonable alternative to the replies e5, c5 and c6? Is the Pirc (Ufimtsev) a competitive opening, from your point of view? Of course. Kramnik added it to his repertoire, and he doesn’t play bad openings. For the moment he hasn’t always succeeded with it – he’s won in classical chess, but lost a few games in Monaco. The thing is that it demands great understanding. It’s a very cunning opening and you need to play and observe it a lot in order to get a feel for it. As you’re giving up the centre one or two inaccurate moves are enough to end up in a difficult situation. But if you know it well, and white plays inaccurately, then you can get an immediate advantage. Boris, can you tell us why you gave up the sharp Najdorf and switched to the duller Russian Game? Firstly, I don’t agree with the evaluations. I’ve played a lot of lively games in the Petroff. Have a look at my book, at the games with Grischuk and Short. Or the defeat I mentioned to Leko in Nalchik. While Najdorf games are often duller, as it’s either a repetition of computer analysis (and a memory contest is not really something I want to get into at the moment), or it’s simply dull play. I’ve had a lot of such games. Secondly, I base my opening choice on the degree to which it suits me, the sort of positions I might get. While the fact that its “sharper” or “duller”… I don’t consider that I have to play in the sharpest or liveliest fashion. I consider that I should play as strongly as I can. How do you assess the work done by FIDE? I can only assess it in relation to professional chess players. And my overall assessment is – very poor. I’ll explain why. In any normal sport two things are a bare minimum. Firstly – over the course of important competitions like the World Championship no changes are introduced. While we’ve already had radical changes introduced twice during the current cycle. Initially it was declared that the winner of the Grand Prix would play a match with the holder of the World Cup for the right to play a match with the World Champion. That was then switched to a candidates tournament, then candidates matches, and now it’s all completely up in the air. It’s totally unclear how candidates matches are going to be held, never mind what’s going to come next. And secondly, in other sports like football we know where, when and in what format the next World Cup will be held. While in chess we’re not even close to that. In general, what’s known as a “World Championship system” is entirely missing. No two cycles in a row have been run soundly and comprehensibly under one and the same system. Although anyone can see it’s essential. No doubt if there was one clear system then FIDE executives wouldn’t be able to manipulate it by including people they like at certain stages, or excluding those they dislike – there’d be less room for intrigue and so on. It would be better for chess players, but worse for the three-five figures in whose interests it’s all being done. On the positive side you can point to the Chess Olympiad being run consistently, with potential organisers even competing for it. I remember 1994 when Moscow saved it at the last moment and ran it, in a fashion, in such conditions that it was embarrassing. Now the Olympiads are announced in advance. The chess calendar has become, overall, richer, with more official tournaments. For example there are now European Championships. And yes – it’s thanks to FIDE. But the fact that there are now more unofficial tournaments is more in spite of FIDE. Everyone remembers how FIDE fought with the organisers of Linares and Wijk aan Zee. How they tried to impose the same time control everywhere. Last year, fortunately, the attempt to change the rating system fell through. That would have almost doubled inflation, although in any case inflation continues at about 5 points a year. That’s how I see it. In other matters I’m not a specialist. I can’t say how chess is developing in African countries. And lastly: who do you support in the upcoming elections for FIDE President? I don’t support anyone, at least at this moment in time, for two reasons. Firstly, neither candidate has yet named their team, and that, it seems to me, is a very important question. Take what Kirsan Ilyumzhinov has done. You can find quite a lot of positives. But it’s hard to imagine anyone finding anything positive in what his team have done. And secondly, who I support or don’t support changes nothing. It all depends on who gets the support of the federations of Ghana, Gabon, Cameroon and other countries where around 30 people can play chess. Their votes will be decisive, as they were in the previous elections. What can Anatoly Yevgenevich [Karpov] do which Kirsan Nikolaevich [Ilyumzhinov] can’t, in your opinion? I don’t know yet. His programme is so general that I wouldn’t want to try and say something definite. I think we’ll learn more as the election approaches. I hope he can get rid of the people who, let’s say, have already hindered chess for 15-20 years, which is almost the whole Kirsan Nikolaevich team. It’s high time to change them. Does the time control need to be shortened? In principle it’s absolutely clear that the majority of spectators are now on the internet. The longer a game, the better for the sites transmitting it – they’ll have a larger audience of chess fans. And higher quality games means more material for analysis, for writing books, magazines and articles on all of those sites, compared to when a game’s played with blunder after blunder, and there’s no work left for the commentators. So that again the interests of three-five people around Kirsan Nikolaevich are in sharp conflict with the interests of chess fans and players. […] I haven’t played in the “cube”, perhaps there’s nothing wrong with it, but overall I disagree with the concept. Well yes, any passer-by can come along and watch people play chess. But what then? They’ll walk on and forget about it. It seems to me that you need to concentrate not on gapers, but on making chess more popular among those who are really interested in it. By various measures somewhere from hundreds of thousands to millions of people to one degree or another are interested in the strongest chess tournaments. They’re the ones we play chess for, and to increase their number we need to promote chess in schools. After the first loss to Kramnik in the London match Kasparov accused you of unethical behaviour. How have your relations with Kasparov been before and after that incident? They’ve been normal. It was an emotional outburst. Someone had to get the blame for the loss, and it fell to me. I’ve got great respect for him and I think he also respects me. And all the rest depends on his mood. Both before and after that episode things have varied. We’ve had both warm conversations and unpleasant situations. In general great chess players have to be judged by their games, and not on what they once said to me or anyone else. That’s totally unimportant to me. So that emotional incident’s long forgotten. Could you share your opinion of Ivanchuk (as a man and a chess player). As a man Vasily Mikhailovich is quite withdrawn. But when you manage to talk with him you can see he’s a very deep and interesting man. And very original. While as a chess player – he’s supreme. It strikes me that the scale of his talent and the class of his play is at the level of a world champion. But there’s something missing. Perhaps it’s consistency in his results, or perhaps he’s too wrapped up in chess itself. For example, FIDE officials constantly excluded him from playing for the World Championship. Take the World Championship in 2005. 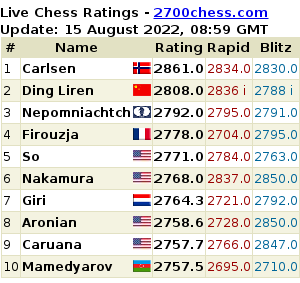 While in 2007 they applied the only rating for the last 10 years which didn’t include Ivanchuk. I don’t know if it was on purpose or not. Anyone else, no doubt, would have put them in their place. After all, making your selection in 2007 based on a rating from 2004 is strange. But Vasily Mikhailovich simply didn’t pay any attention to it. And missed the cycle. While the number of tournaments that he’s won, and the games that he’s playing, all show that he’s a unique chess player. Which playing factors will the “old” generation try to use in order not to concede its positions to the “youngsters”? There are common factors – understanding, experience, the ability to work effectively. But all of us have our own style and approach to the game, our trademark qualities. Anand has colossal intuition, Topalov has a feel for the initiative, Ivanchuk – an outstanding understanding of chess. The young players have to grasp which factors they can use to squeeze us out, which characteristics they need to develop. They’ll have to put in a huge amount of work to develop those qualities and continue to progress. What’s your prediction for the upcoming Topalov-Anand match, and who are you rooting for? I’m rooting for Anand. We’re the same age, and we’ve got on very well together for many years. But the main thing is that Topalov and his team put on a shameful show in Elista. They nearly brought an end to a World Championship match. The first four games were lively and an interesting struggle. And then there was a nervousness that sharply reduced the level of play from both players. And they still haven’t apologised and repeat the most stupid allegations. While all around the world chess for a long time afterwards was associated with a toilet. As chess players, both Topalov and Anand are players of the highest level. And their chances are about equal. The result will depend on who can impose his own character on the struggle. Can you please characterise the most promising young players – Carlsen, Karjakin, Caruana, Nakamura, Giri… Is there something specifically new and distinctive in this generation – or is it, as it’s always been, simply that they play chess well? Yes, they all play chess well. But in different ways. Each has his own style. Take the style of Carlsen or the style of Nakamura, it’s difficult to find something less similar. What do they have in common? No doubt they process information quicker – they were simply born with computers. But quicker doesn’t necessarily mean deeper. On the contrary, with some of them you can observe a certain computer-dependency. Carlsen and Karjakin have already developed as players of the very highest level. Caruana, Nakamura, Giri… Nakamura’s older and is showing good results. But you can see that he has clear gaps in his game. Can he neutralise them with his strong qualities? Time will tell. While Caruana and Giri are still very young players. In general, I haven’t seen Giri play at close quarters. I mean I haven’t played with him. I know Caruana, we’ve played for the same team. I’ve seen him during and after games. He works really hard on his chess. Alexander Chernin and Yury Sergeevich Razuvaev have worked with him, so he’s had good training. I hope he’ll be able to reach the very top. Is there any promising chess star in Israel? Who would you point to as a potential 2700 player in the coming years? I think Maxim Rodshtein is the most promising. He assisted me in Khanty-Mansiysk, and I got to know him better there. He’s got all the requirements to get to 2700 in the next few years. Again I really hope that it works out for him. And I’ll try to help. Did you ever regret that you devoted your life to chess – beautiful and precious, but all the same a game, and quite a marginal one at that? Do you not feel as though you’re a Great Master of “The Glass Bead Game”? I’ve never regretted it. I think I’m doing something remarkable and worthwhile which also brings me great pleasure. That’s not something you can say about every profession. No doubt there are more worthwhile jobs, bringing more benefit to society. For example, teachers or academics. But there are very many professions which do less good, it seems to me. For example, an official in the municipal administration. My work is similar to that of a classical musician or sportsman, with performances and successes that are followed. I bring pleasure to the tens of thousands of people who watch my games and support me. So I don’t have any psychological complexes on that count and, in fact, I’m proud to have such a profession. Boris Abramovich, I heard that you’ve long been a fan and expert on football, do you have favourite teams and footballers? Yes. Among footballers – Cruyff, because he’s done more than anyone to transform the world of football. And then the teams that he had something to do with. Holland, Ajax and Barcelona. You could say that he set the approach for the development of all those teams. And I support them, with great passion. Particularly in recent years, when Barcelona have been such a joy. I like how in contrast to other great clubs they have many players from their own youth setup. Boris, can you say who you’re going to support at the football World Cup? Holland. And also Spain, as they’ll have so many Barcelona players. Who’s going to win? Who’s favourite for the cup? Which European team can we expect to put up a good show? The favourites are the same as usual. Brazil, Argentina and the best European teams. England, it seems to me, could do well. The Spanish are playing brilliantly at the moment. But it’ll all depend on the last few months. A lot of players have been injured, but at the end of the season might still take part. The players are all tired. And after a hard season – the World Cup. So whoever recovers better will win. I think it’ll be an interesting competition. It’s also pleasant that it’s going to be played in our time zone and we’ll be able to watch at a convenient time. Although no doubt I’ll be at tournaments, I’ll try to watch. Great website mishanp !! Certainly adds value to us non Russian chess fans. Great site, and great work. You are doing an amazing job for chess, thank you very much! Thanks! I’m glad you like it. It looks as though I’ll be able to work closer with Crestbook in future, so there should be more interviews and other material like the above soon! Wow! He got the finalists right. Gelfand is Octopus.